Predictive Maintenance, or “PdM”, can be considered to be the most advanced form of Preventative Maintenance, in referring to the optimizing of the sustainment approach for a fielded asset. It’s primary approach includes the developing of the methods and means to detect and rectify failures of an equipment or system sufficiently in advance of the failure(s). Predictive Maintenance infers that specifically-defined impending failures will be identified, or “prognosed” in advance or their “failure” as characterized and defined from an operational perspective. This approach may typically consider the development or reliance upon a variety of either existing or newly developed, specialized sensors and include the associated maintenance method(s) capable of providing such knowledge of the progression towards a realized failure. The chart above describes the progression of a failure over time in its typical operational application. The orange line represents this progression of a failure. The top-right corner depicts the time interval beginning where the failure first begins to experience some degradation at its lowest physical level. At such time, operation may continue, but at a degraded level. As time continues, the impending failure progresses through its precomputed failure horizon, and ending at the top of the orange line with the actual failure becomes realized. The observing of the failure progression is performed through the use of very advanced sensing technologies that employ very specific algorithms that have been calculated from the studying of the actual Physics of the failure progression. This is a very specialized and, typically expensive activity that involves the use of establishing sufficient data collected from, at a minimum, the measuring and sensing of the failure progression unique to the physical properties of the target subject. Although the science, methods and means to derive and to “predict” the failures of any component can involve very specialized and extensive expertise, we are, instead concerned with the taking full advantage of any inclusion of this sort of technology being fully incorporated into maximizing the Diagnostic design and sustainment capability of the fielded product. For example, determining the diagnostic or prognostic effectiveness of the sensors (BIT location, coverage, diagnostic validation, etc.) is the first step in determining the effectiveness of the prediction and sustainment methods upon the fielded asset(s). Predictive Maintenance is based on the science of being able to predict the Remaining Useful Life (RUL) of a component. Data to support this predictive technology, is acquired from the studying and measuring of the physical characteristics of the component at the very lowest physical level during its progression to failure. Advanced techniques are used to accelerate the experience of the failure, such as “Highly Accelerated Life Test” (HALT) and “Highly Accelerated Stress Test” (HASS). Complex algorithms are used to represent the failure progression as based upon the expected condition of the component as it degrades to full failure status. As a companion activity, the sensing technologies or any related hardware devise(s), instrumental to the precision needed to observe these changes at the lowest physical level, may also become part and parcel to instituting effective high-end CBM approaches for critical or complex systems. But many CBM activities do not need to require such sophistication. As a result, the sort of maintenance activity that would be pursued to prevent the realization of the impending failure, would be based upon the trending of the failing condition. This is generically referred to as “Condition-based Maintenance” (CBM). CBM+ is pursued through the examination, evaluation, and implementation of enabling technologies, tools, and process improvements from public and private sources, which infers the exploiting of an ongoing and evolving process. This is where DSI’s ISDD objective and structured approach is suited to more narrowly frame the expected value of the predictive maintenance approach (in terms of Availability, Safety, Operational Success, Ownership Cost, etc.) than any other independently-performed assessment methodology. DSI’s eXpress modeling environment captures, structures, organizes and integrates the diagnostic and prognostic capability of the entire fielded asset into a deterministic IP asset, or “knowledgebase”. All assessment products are simple “turn-key” outputs from this same knowledgebase as can be immediately (re)deployed to the field to drive or augment virtually form. DSI’s advanced companion ISDD tools, consider the over-arching diagnostic integrity of the fielded and maintained asset(s), allowing the evolving of consistently collected fielded data to be appropriately considered for enriched applications. Prognostics Health Management (PHM) infers the reliance on the decision-making based upon CBM, but not all prognostics methods are designed to be autonomously managed and executed as an integral component of PHM. Prognostics may include the designing of a health management system and specialized sensors to identify the physics of failure characteristics of critical components onboard a vehicle or system. 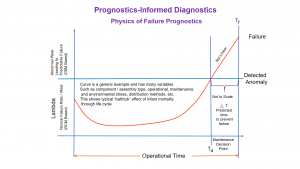 Less sophisticated applications of prognostics-informed diagnostics may be the use of a simple observable gauge, indicator or other practice that will pose an alert in advance of a failure, which could also be categorized as serving the function of a prognostic capability. Certainly reducing the likelihood of experiencing any failure is desirable, but that benefit always comes at a cost. With ISDD and STAGE, our objective is to measure the benefit versus its cost and to determine what failures may be more affordable, in any sense of affordability, to experience than to prevent from occurring. In this objective, and since we already have captured the entire diagnostic integrity of design, we can be a bit aggressive and do much more informed simulation-based assessments on such designs and support trades. For example, do we know if the prescribed Preventative Maintenance action(s) resulted in the actual increased “Operational Availability”? If so, at what cost? Did this corrective action enable the continued use of the equipment or system while increasing the risk of safety? Did it also cause the possibility of any additional cost of a more intrusive repair action resulting from the “cascading” of the failure(s)? These questions aren’t even scratching the surface yet in showing just how far the benefit versus cost trades can go with STAGE, but when you’re ready to go forward, the ability to acquire the Prognostics-Informed Diagnostics on your design is already in place. Another advantage of observing the STAGE results, will provide more holistic data analytics on the use of PHM, or along with any other Preventative Maintenance tactic. But securing the accurate diagnostic conclusions will always be the key to success with any Predictive or Preventative Maintenance strategy. Without STAGE, or accurate diagnostic assessment validation, we truly wouldn’t “know” if our data regarding the execution of the Predictive Maintenance resulted from any uncertain or wrongful indication of the existence of a failure (caused from the failure to exhaustively validate the diagnostic capability). As a result, our decision-making would be based upon our presumption that our reporting of a failure regardless. These sort of diagnostic uncertainties are not easily observed in any other design development or operational support paradigm. Fortunately, these areas that can be hidden, but significant cost drivers, are painfully apparent in ISDD and STAGE. The primary goal of Predictive Maintenance is to provide an opportunity to evade the experience of any critical failure(s), by the performing of either an autonomous remediation event, and/or the most effective corrective action(s) to avoid the effects caused by the experiencing the “insipient” failure(s). The core objective of Preventative Maintenance is to repair or replace the correctly isolated “presumed to be failing” component(s) during a planned or unplanned maintenance event. In the case of the occurrence of an “unplanned” Preventative Maintenance activity, the objective would be to negotiate the “presumed to be failing” component(s) after the first signs of degradation, but before either the next Scheduled Maintenance action to prevent interim breakdown. In order to do this, signs of degradation must be detected as early and as clearly as possible. Is Predictive Maintenance Value or Undetermined Cost? While desiring to develop a Predictive Maintenance capability is the immediate objective, there are many costs trade-offs and factors that need to be comprehensively considered. Most of the cost and predictive capabilities may end up by constraining the sustainment alternatives and their effectiveness, which isn’t typically an initial consideration until the investment has already set the course in stone. Often overlooked is the fact that many predictive approaches involve expertise that is costly and typically not going to be readily available when the asset is fielded – at least not available for a reasonable cost. So, unless the expertise is retained in house, and not about to be moved onto another program or possibly about to retire, then investigating predictive approaches above the low-hanging fruit may have some cost benefits to the system integrator or customer. Then there is the consideration of the limits of the expertise of the PHM or IVHM designer. Typically, this is where the preponderance of the expertise is retained at the specific piece of the design that the expert develops. which such knowledge isn’t so readily available to transfer to others. So, let’s be more careful and step back to weigh all of our options before we are persuaded to rely on a strategy that assumes that the predicting of failures is the optimum solution in every case. With DSI’s ISDD, the assessing of the effectiveness of PdM along with any corrective sustainment approach can be performed in eXpress and also simulated in the sustainment lifecycle using “STAGE” (DSI’s Health Management and Operational Support Simulation Application). The diagnostic integrity of the system at the “system level”, or fielded product level, is where the constraints of the effectiveness of any sustainment alternative begins. Once fielded, the diagnostic or predictive maintenance capabilities will be what they minimally can be. In other words, if we aren’t certain of our diagnostic capability, then our predictive capability as determined by its presumed effectiveness, will be an uncertainty. Establishing of a “diagnostic baseline” capability provides the essential foundation required to establish where and how much should be invested into the more lavish predictive technologies or options. ISDD, and more specifically, STAGE, provides the vetted diagnostic capability at the system level to that can provide a seamless canvas to “balance” the sustainment alternatives or approaches with their associated costs to observe their effectiveness in the sustainment lifecycle(s). In this manner, a much more holistic assessment can be performed to discover the value and diagnostic effectiveness of deploying Predictive or “Preventative” Maintenance in comparison to Corrective Maintenance, often referred to as “Run-to-Failure” maintenance, or any mix therein. Predictive Maintenance must examine the current condition of the equipment and determine if the expected Remaining Useful Life (RUL) of any “critical” components of the system is sufficiently long enough (“Failure Horizon”) for the equipment to be used “adequately” in the next operation or mission. If so, then the equipment is able to be relied upon to complete the task, or operation, which yields a perception that this benefit of Predictive Maintenance appears to be a most desired method to ensure the operational availability objective of that equipment or complex system(s). The approaches and methods for engaging in the ideals of Predictive Maintenance practices has received a great deal of attention over the past half century. By monitoring the mechanical condition of the critical equipment using parameters and indicators such as heat distribution, vibration patterns and acoustic characteristics continuously by the help of different sensors and measurement systems, maintenance can be scheduled when needed. Over the past 10-15 years, a significant focus on the studying the “Physics of Failures” has led to a hope that, one day, most any failure can be prevented or predicted by carefully analyzing the “physics of the failure” (PoF) patterns, and creating the “sensors” to precisely observe and measure the progression of the “precursor” to the failure, a competency of “Prognostics”. This would enable the Predictive Maintenance events to be scheduled in advance of a failure based upon the Condition of sensed component(s), ultimately defined as “Condition-Based Maintenance”, or CBM. Scheduled Maintenance, or Reliability-Centered Maintenance (RCM), is the traditional form of Preventative Maintenance. This approach is based upon applying reliability-centric engineering principals into the scheduling and planning events to replace components prior to experiencing their failure. In this regard, components are then expected to fail individually, and in accordance with their specific individual reliability engineering “predicted” failure characteristics. This is the assumption used to support the “scheduling” of the maintenance intervals and the related activities in a maintenance philosophy where the primary objective is to avoid the more costly failures. Using Scheduled Maintenance, components may be replaced more closely to their anticipated failure (“tight”) to squeeze out a bit more use of the components at the risk of them failing just prior to replacement. Else, the Scheduled Maintenance may allow a more conservative approach where the components are replaced further in advance of the anticipated failure (“loose”), which may be at the risk of “premature replacement”, and may add more to the cost of ownership, but could increase the likelihood of operational success. In either leaning towards a tighter or loser Scheduled Maintenance paradigm, the replacement will always be constrained by the limitations of the diagnostic capability of the fielded design, which is typically unknown by many manufacturers or Systems Integrators. This unknown would render the use of operational support trade studies of very limited value, unless of course, that the diagnostic capability was determined in eXpress and the maintenance philosophy was simulated in STAGE to provide data on the effectiveness of the Scheduled Maintenance plan as based upon the diagnostic integrity of the fielded system(s). Preventative or Corrective Maintenance activities may lead to the use of “Opportunistic” Maintenance, which would target the advance replacement of components based upon the aspect of “convenience” and their likelihood of failing or becoming degraded sufficiently to risk operational success, when performing a related maintenance activity. Again, this would be performed to address system availability, operational success and safety while maybe reducing or increasing cost of ownership. Regardless, this activity is still a predictive activity that is based upon aspects of both an RCM and CBM events. Opportunistic Maintenance is an “a la carte” sort of methodology that enables the decision-making to consider the interdependencies of the components, structures and variable costs associated with any replacement or repair activity. With ISDD, the interrelationships of any on the components, structures or designs are already established and can be fully vetted. So the trading of an effective Opportunistic Maintenance plan can be evaluated with any design where the interdependent functional and failure properties have been fully defined and captured in eXpress, which is a high-end diagnostic engineering tool. This will avail an advantage of assessing the impact of this form of preventative maintenance strategy along with any mixture of designs, processes, structures or economic parameters. Opportunistic Maintenance strategies can be effectively applied in design development for any (balance or “mixture”) of maintenance paradigms, including manufacturing, production, and field-based sustainment decision-making. With DSI Workbench, the maintenance or lab technician is fully armed with all of the diagnostic, testing, repairing or guided troubleshooting knowledge captured throughout the design development and sustainment lifecycles. Corrective Maintenance is based upon the repair of a failed item, or “run to failure”. This is an approach that may be cost effective and is based upon the system integrator being sharp enough to actually realize how to maximize the benefit of CM along with CBM, CBM+, RCM and OM. This “balancing” of implementing the optimized mix of either of these approaches to sustainment is a DESIGN INFLUENCE event. There are a few programs out there that have fully institutionalized this Integrated Systems Diagnostics Design (ISDD) influence activity and these organizations are far ahead of any of those that fall prey to cornering themselves into producing designs that fall unchecked into one specific approach or another, rendering their approaches to be “out of balance”, inadvertently or otherwise. This is why any of the sustainment approaches need to be examined in design development (and ongoing) to determine the best “balance” or “mix’” of using any or all of these Predictive and/or Corrective Maintenance strategies. The initial impediment to any reliability-centric approach is that it has been traditionally segregated from the deeper diagnostic engineering activities, which in turn, are typically not performed in time provide valuable input for the selecting of components and validating test coverage for the purposes of the final intended usage of the design. ISDD enables a much more robust and holistic methodology of using the validated diagnostic capability inherent to the design, and based upon any integrated interdependencies of the individual designs or components contained therein, to explore the optimal balancing of maintenance activities. ISDD goes another step further and incorporates the “maintenance philosophy” along with the design’s diagnostic capability to determine seed Operational Maintenance Simulations that also include the impact of maintenance events. The ability to combine and assess the maintenance philosophy as required by the customer or asset owner(s) along with the captured diagnostic design knowledgebase of the asset (fielded equipment, product or “integrated system) and then directly bring that optimal balance of predictive versus corrective maintenance to the field is unique to ISDD. Furthermore, and coupled with the operational use of “DSI Workbench” (portable maintenance application), the maintenance or lab technician is fully armed with all of the diagnostic, testing, repairing or guided troubleshooting knowledge ever captured, or updated with empirical data throughout the design development and sustainment lifecycles. Without the ability to determine the diagnostic baseline, the capability and effectiveness of the design, along with any approach to the use of any form of Condition-Based or Predictive maintenance applications, is putting the cart in front of the horse and a recipe for costs stemming from undeterminable diagnostic ambiguity. A sound diagnostics engineering approach (or ISDD) performed early in the design development phase should produce invaluable information and detail to the effectiveness of any sustainment approach.